Scientists are unraveling more information on Comet C/2012 S1 (ISON) as it continues on its journey toward the sun. Comet C/ISON will skim 730,000 miles above the sun’s surface on Nov. 28 and has the potential to be readily visible from Earth starting in early December. 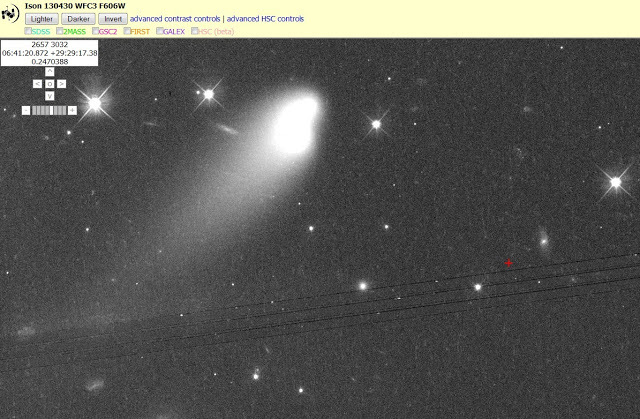 This image shows the color change of Comet C/ISON’s dust coma. The white dot at the center of the coma marks the location of the nucleus. ISON’s dust coma appears to be less red near the nucleus than it is further away from the nucleus. Although the color change is actually very small, it could be an indication of relatively more water ice particles near the nucleus. Those icy particles evaporate, as they move outward, makes the coma appear redder. Image credit: NASA, ESA, J.-Y. Li (Planetary Science Institute) and Hubble Comet ISON Imaging Science Team. “We measured the rotational pole of the nucleus. The pole indicates that only one side of the comet is being heated by the sun on its way in until approximately one week before it reaches it closest point to the sun,” said Planetary Science Institute Research Scientist Jian-Yang Li, who led a team that imaged the comet. “Since the surface on the dark side of the comet should still retain a large fraction of very volatile materials, the sudden exposure to the strong sunlight when it gets closer to the sun than Mercury could trigger huge outbursts of material,” Li said. Li presented the findings today at the American Astronomical Society’s Division for Planetary Sciences 45th Annual Meeting in Denver.